Gardening tip: Dividing Boston Ferns is an easy way to stretch your gardening budget and to get you 2-3 plants for the price of one. I divide Boston Ferns because 1) they can be expensive; 2) they are usually crowded in the hanging basket and hard to water; and 3) I just like to double my value. Boston Ferns (Nephrolepis exaltata) do not have deep roots in the hanging basket you buy from your local home store and garden center. The fibrous roots of the Boston Fern grow near the top of the soil and grow rather dense. 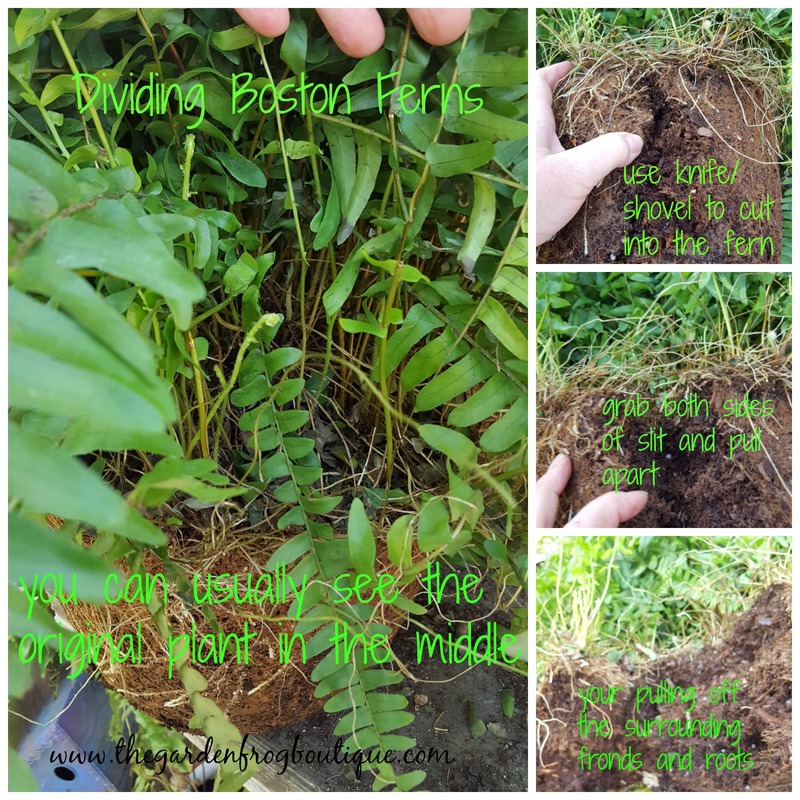 In order to divide the ferns you will need to cut through these roots (don’t worry it does not hurt them) and plant the newly divided ferns in a lighter humus type soil (take notes from what the soil that it grows in from the nursery). 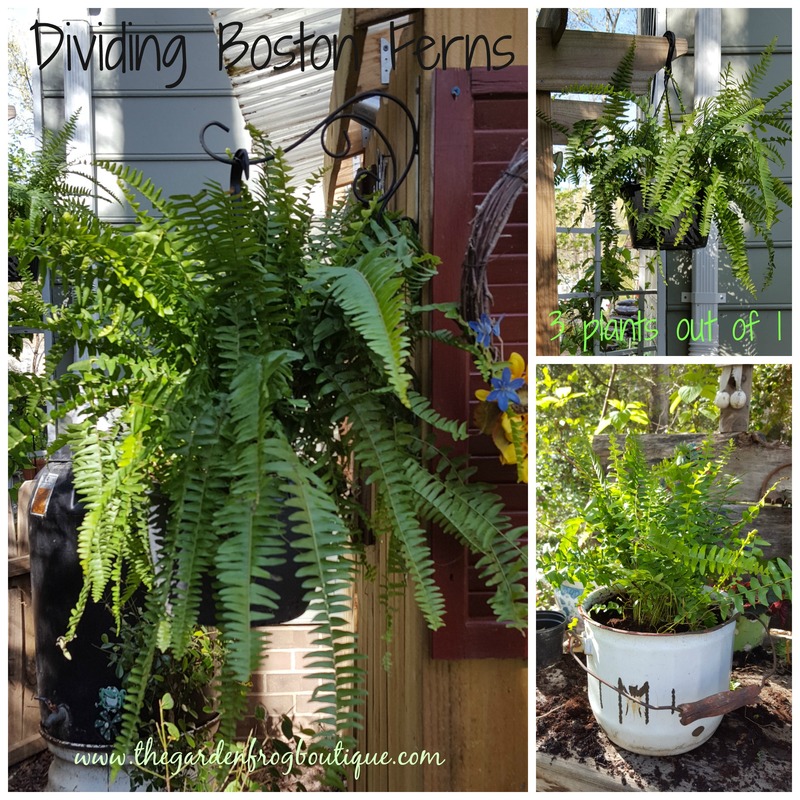 I usually divide 1 Boston Fern into 3 separate plants! I usually take the original plant and put it back in the original hanging basket to put in the more dominant places in my garden. The other divisions, if they do not look as plush and full as the original, I pot up in empty baskets or pots and place them in less seen places. Boston Ferns take only a a few weeks to start to fill in the pot and reward you with beautiful green fronds that arch as they grow. 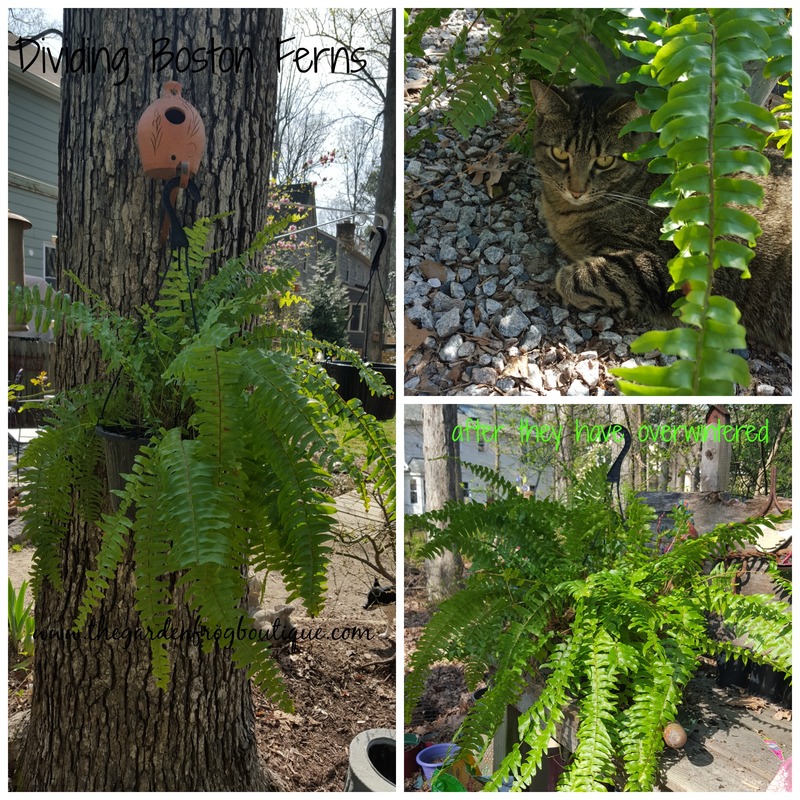 Care for Boston Ferns is pretty simple and carefree- bright light but not direct sun so they do great hanging on the covered front porch, from a tree in the shade in the backyard, or in the morning sun perched on garden bench or stump in the garden. Keep them moist but not wet. 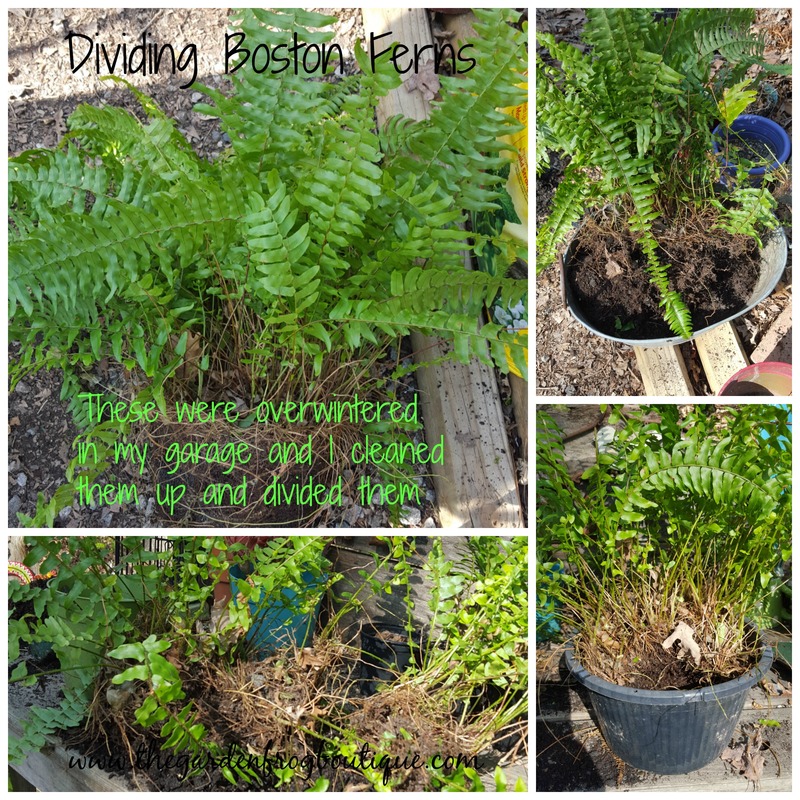 Boston Ferns will recover from a couple times of drying out and be sure to fertilize them during the spring and summer to keep them strong and healthy. 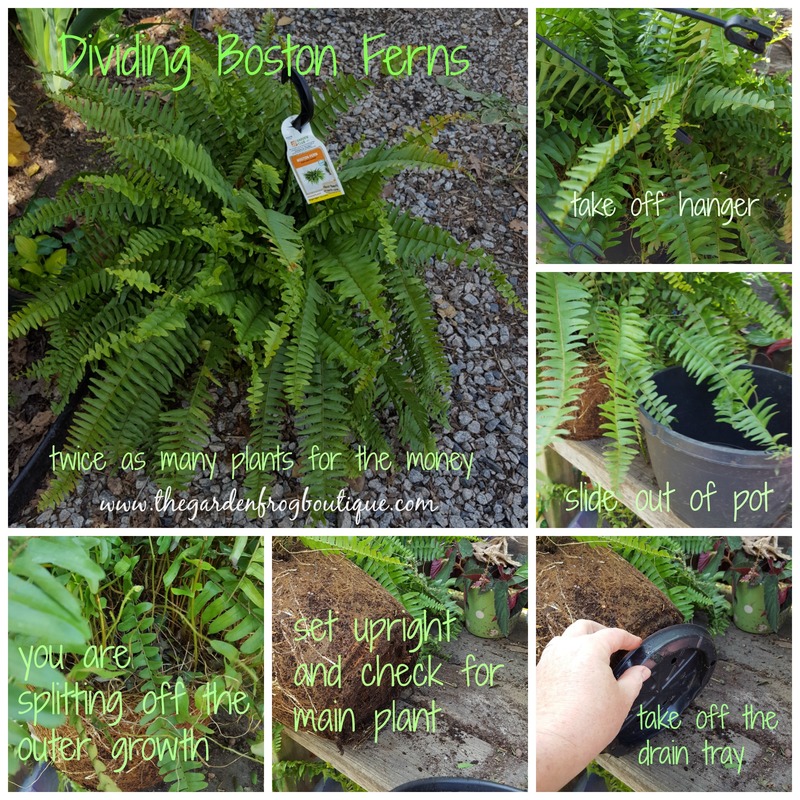 In the fall bring the Boston Fern inside to overwinter in the garage (I am in zone 7 so my garage stays above freezing) or in a cool room in the house. They love a room around 65 degrees and I leave mine out until the temps dip to 50 at night and put it in the garage. Remember when you bring plants in you need to spray for bugs (I prefer organic methods like Neem Oil) or you can give them a shower using an insecticidal soap or even Ivory or Dawn dishwashing liquid to remove any bugs. Boston Ferns will shed for most of us in the house usually because a lack of humidity and if they got too chilled outside before bringing them in; and, in my opinion, because they like being outside. Do not worry because the Boston Fern will bounce back the minute you can clean, repot, and sit them back outside in the spring. Thank you for stopping by and reading my blog. If you ever have a question, feel free to contact me.